Governor-general (plural governors-general) or governor general (plural governors general), in modern usage, is the title of an office-holder appointed to represent the monarch of a sovereign state in the governing of an independent realm. Governors-general have also previously been appointed in respect of major colonial states or other territories held by either a monarchy or republic, such as French Indochina. In modern usage, the term governor-general originated in those British colonies which became self-governing within the British Empire. Before World War I, the title was used only in federated colonies in which each of the previously constituent colonies of these federated colonies already had a governor, namely Canada, Australia, and the Union of South Africa. In these cases, the Crown's representative in the federated Dominion was given the superior title of governor-general. The first exception to this rule was New Zealand, which was granted Dominion status in 1907, but it was not until 28 June 1917 that Arthur Foljambe, 2nd Earl of Liverpool, was appointed the first Governor-General of New Zealand. Another non-federal state, Newfoundland, was a Dominion for 16 years with the King's representative retaining the title of governor throughout this time. Since 2016,[why?] the title governor-general has been given to all representatives of the sovereign in independent Commonwealth realms. In these cases, the former office of colonial governor was altered (sometimes for the same incumbent) to become governor-general upon independence, as the nature of the office became an entirely independent constitutional representative of the monarch rather than a symbol of previous colonial rule. In these countries the governor-general acts as the monarch's representative, performing the ceremonial and constitutional functions of a head of state. 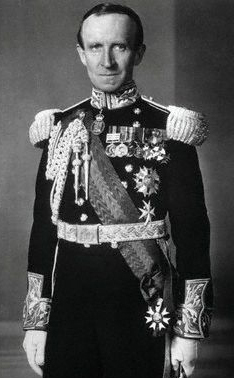 Lord Tweedsmuir was Governor General of Canada from 1935 to 1940. The uniform shown here was the unique ceremonial dress for Governors General of Canada. Until the 1920s, governors-general were British subjects, appointed on the advice of the British government, who acted as agents of the British government in each Dominion, as well as being representatives of the monarch. As such they notionally held the prerogative powers of the monarch, and also held the executive power of the country to which they were assigned. The governor-general could be instructed by the colonial secretary on the exercise of some of his functions and duties, such as the use or withholding of the Royal Assent from legislation; history shows many examples of governors-general using their prerogative and executive powers. The monarch or imperial government could overrule any governor-general, though this could often be cumbersome, due to remoteness of the territories from London. The governor-general was also usually the commander-in-chief of the armed forces in his or her territory and, because of the governor-general's control of the military, the post was as much a military appointment as a civil one. The governors-general are entitled to wear a unique uniform, which is not generally worn today. If of the rank of major general, equivalent or above, they were entitled to wear that military uniform. Following the Imperial Conference, and subsequent issuing of the Balfour Declaration in 1926, the role and responsibilities of the governor-general began to shift, reflecting the increased independence of the Dominions (which were in 1952 renamed Realms; a term which includes the UK itself). As the sovereign came to be regarded as monarch of each territory independently, and, as such, advised only by the ministers of each country in regard to that country's national affairs (as opposed to a single British monarch ruling all the Dominions as a conglomerate and advised only by an imperial parliament), so too did the governor-general become a direct representative of the national monarch only, who no longer answered to the British government. The report resulting from the 1926 Imperial Conference stated: "...it is an essential consequence of the equality of status existing among the members of the British Commonwealth of Nations that the Governor General of a Dominion is the representative of the Crown, holding in all essential respects the same position in relation to the administration of public affairs in the Dominion as is held by His Majesty the King in Great Britain, and that he is not the representative or agent of His Majesty's Government in Great Britain or of any Department of that Government." These concepts were entrenched in legislation with the enactment of the Statute of Westminster in 1931, and governmental relations with the United Kingdom were placed in the hands of a British High Commissioner in each country. In other words, the political reality of a self-governing Dominion within the British Empire with a governor-general answerable to the sovereign became clear. British interference in the Dominion was not acceptable and independent country status was clearly displayed. Canada, Australia, and New Zealand were clearly not controlled by the United Kingdom. The monarch of these countries (Elizabeth II) is in law Queen of Canada, Queen of Australia, and Queen of New Zealand and only acts on the advice of the ministers in each country and is in no way influenced by the British government. Today, therefore, in former British colonies which are now independent Commonwealth realms, the governor-general is constitutionally the representative of the monarch in his or her state and may exercise the reserve powers of the monarch according to their own constitutional authority. The governor-general, however, is still appointed by the monarch and takes an oath of allegiance to the monarch of their own country. Executive authority is also vested in the monarch, though much of it can be exercisable only by the governor-general on behalf of the sovereign of the independent realm. Letters of Credence or Letters of Recall are now sometimes received or issued in the name of the monarch, though, in some countries, such as Canada and Australia, the Letters of Credence and Recall are issued in the name of the governor-general alone. Except in rare cases (example, a constitutional crisis), the governor-general usually acts in accordance with constitutional convention and upon the advice of the national prime minister (who is Head of the nation's Government). The governor-general is still the local representative of the sovereign and performs the same duties as they carried out historically, though their role is for the most part ceremonial (or partly ceremonial). Rare and controversial exceptions occurred in 1926, when Canadian Governor General the Viscount Byng of Vimy refused Prime Minister Mackenzie King's request for a dissolution of parliament; in 1953 and 1954 when the Governor-General of Pakistan, Ghulam Mohammad, staged a constitutional coup against the Prime Minister and then the Constituent Assembly; and in 1975, when the Governor-General of Australia, Sir John Kerr, dismissed the Prime Minister, Gough Whitlam (to name a few). It should be remembered that while the governor-general doesn't normally take drastic action, he/she still has a responsibility to ensure that the constitution is respected and followed at all times. In many ways the governor-general acts as an Umpire/Mediator (who must remain independent/non partisan and objective) in the political scene. In some realms, the monarch could in principle overrule a governor-general,[how?] but this has not happened in modern times. In Australia the present Queen is generally assumed to be head of state, since the governor-general and the state governors are defined as her "representatives". However, since the governor-general performs almost all national regal functions, the governor-general has occasionally been referred to as head of state in political and media discussion. To a lesser extent, uncertainty has been expressed in Canada as to which officeholder—the monarch, the governor general, or both—can be considered the head of state. Traditionally, the governor-general's official attire was a unique uniform, but this practice has been abandoned except on occasions when it is appropriate to be worn (and in some countries abandoned altogether). In South Africa, the Governor-General of the Union of South Africa nominated by the Afrikaner Nationalist government chose not to wear uniform on any occasion. Most governors-general continue to wear appropriate medals on their clothing when required. The governor-general's official residence is usually called Government House. The Governor-General of the Irish Free State resided in the then Viceregal Lodge in Phoenix Park, Dublin, but the government of Éamon de Valera sought to downgrade the office and the last governor-general, Domhnall Ua Buachalla, did not reside there. The office was abolished there in 1936. In most Commonwealth realms, the flag of the governor-general has been the standard pattern of a blue field with the Royal Crest (a lion standing on a crown) above a scroll with the name of the jurisdiction. In Canada, however, this was replaced with a crowned lion clasping a maple leaf. In the Solomon Islands, the scroll was replaced with a two-headed frigate bird motif, while in Fiji, the former Governor General's flag featured a whale's tooth. In New Zealand, the flag was replaced in 2008 with the shield of the coat of arms of New Zealand surmounted by a crown on a blue field. Following the changes to the structure of the Commonwealth in the late 1920s, in 1929, the Australian Prime Minister James Scullin established the right of a Dominion prime minister to advise the monarch directly on the appointment of a governor-general, by insisting that his choice (Isaac Isaacs, an Australian) prevail over the recommendation of the British government. The convention was gradually established throughout the Commonwealth that the governor-general would be a citizen of the country concerned, and would be appointed on the advice of the government of that country, with no input from the British government; Governor General of Canada since 1952 and Governor-General of New Zealand since 1967. Since 1931 as each former Dominion has patriated its constitution from the UK, the convention has become law, or, since 1947, when the first realms established with a patriated constitution, India and Pakistan, were established, was always law, and no government of any realm can advise the Monarch on any matter pertaining to another realm, including the appointment of a governor-general. The monarch appoints a governor-general (in Canada: governor general) as a personal representative only on the advice of the prime minister of each realm; for example, the Governor-General of New Zealand is appointed by the Queen of New Zealand on the advice of the New Zealandian prime minister, the Governor-General of Tuvalu is appointed by the Queen of Tuvalu on the advice of the Tuvaluan prime minister, and the Governor-General of Jamaica is appointed by the Queen of Jamaica on the advice of the Jamaican prime minister. In Papua New Guinea and the Solomon Islands, the Prime Minister's advice is based on the result of a vote in the national parliament. the Duke of Gloucester, son of King George V, was Governor General of Australia. The formalities for appointing governors-general are not the same in all the realms. For example: When appointed, a Governor-General of Australia issues a proclamation in his own name, countersigned by the head of government and under the Great Seal of Australia, formally announcing that he has been appointed by the monarch's commission, previously issued also under the Great Seal of Australia. The practice in Canada is to include in the governor general's proclamation of appointment, issued under the Great Seal of Canada, the monarch's commission naming the governor general as Commander-in-Chief of the Canadian Forces Also dissimilar among the realms are the powers of governors-general. The Belizean constitution provides the governor-general with the power to assent or to withhold assent to laws, while Papua New Guinea has no requirement for royal assent at all, with laws entering into force when certified as having been passed in Parliament by the Speaker. For a list of current Governors-General in Commonwealth countries, see Representatives of the Commonwealth of Nations. In Australia, an Administrator of the Commonwealth may be appointed to perform the necessary official functions, pending a decision by the sovereign, on the advice of the prime minister, about a permanent replacement as governor-general. The administrator has usually been the senior state governor. Each state governor normally holds what is known as a dormant commission. There have been cases where a governor has fallen out of favour with the government, causing their dormant commission to be revoked. The most recent example was that of Sir Colin Hannah, Governor of Queensland, in 1975. In The Bahamas, Barbados, Canada, Jamaica, and New Zealand, it is the Chief Justice. The title has been used in many former British colonies, which became independent realms and then later became republics. Each of these realms had a governor-general. In Rhodesia (now Zimbabwe), a unique situation arose following the Unilateral Declaration of Independence in 1965, unrecognised by the United Kingdom. The Rhodesian Front government of Ian Smith recognised Elizabeth II as "Queen of Rhodesia", but refused to recognise the authority of her Governor Sir Humphrey Gibbs, whose duties were performed by an Officer Administering the Government, Clifford Dupont (1905–1978). Dupont served in the post until 2 March 1970, when Rhodesia was declared a republic (an act also unrecognised internationally) and he became President. The country became an independent republic within the Commonwealth as Zimbabwe on 18 April 1980. From 1887 to 1945 the French appointed a governor-general to govern French Indo-China (now Vietnam, Laos and Cambodia); the function of High commissioner in the Pacific Ocean, from 22 March 1907 held by the Governors of New Caledonia, was used to coordinate that colony, the other French settlements in Oceania and the governors-general of French Indochina and the Resident commissioners of the New Hebrides and the Residents of Wallis and Futuna were subordinated to him. Governor General of New France was the vice-regal post in New France from 1663 until 1760 and was the last French vice-regal post. It was replaced by the British post of Governor of the Province of Quebec following the fall of New France. While the districts of Montreal and Trois-Rivières had their own governors, the Governor General of New France and the Governor of the district of Quebec were the same person. From 1699–1947, the French appointed a Governor-General to administer French India (including Pondichéry). From 28 June 1908 (previously it had a Commissaire général, i.e. Commissioner general) to 4 April 1957 (the last stayed on as first of three High commissioners) in French Equatorial Africa (AEF); during several periods he also acted as Governor of the constitutive colony Congo Brazzaville. From 1691 to 1948 the Dutch appointed a gouverneur-generaal ("governor-general") to govern the Netherlands East Indies, now Indonesia. in Africa, from 1837 Portugal appointed a governor-general to govern the overseas province of Angola, and another to govern the province of Moçambique. For some time, a governor-general was also appointed to rule Cape Verde and Portuguese Guinea, while these territories were united in a single province. Between 1921 and 1930, additional powers were given to some of the Angola and Mozambique governors, who were restyled in full Alto-comissário e governador-geral (High commissioner and governor-general). From 21 November 1564 the Spanish East Indies had a governor-general, which was under the Viceroy of New Spain based in Mexico. After the successful Mexican War of Independence in 1821, the governor-general reported directly to Spain. From 1899 to 1935 under the Insular Government, the Philippines was administered by a series of governors-general, first military and then civilian, appointed by the United States Federal Government. The Balkan Wars of 1912–13 led to the Greek acquisition of the so-called "New Lands" (Epirus, Macedonia, Crete and the islands of the eastern Aegean), almost doubling the country's territory. Instead of fully incorporating these new lands into Greece by dividing them into prefectures, the Ottoman administrative system continued in existence for a while, and Law ΔΡΛΔ΄ of 1913 established five governorates-general (Γενικαὶ Διοικήσεις, sing. Γενική Διοίκησις): Epirus, Macedonia, Crete, Aegean and Samos–Ikaria. The governors-general had wide-ranging authority in their territories, and were almost autonomous of the government in Athens. Law 524 in 1914 abolished the governorates-general and divided the New Lands into regular prefectures, but in 1918 Law 1149 re-instated them as a superordinate administrative level above the prefectures, with Macedonia now divided in two governorates-general, those of Thessaloniki and Kozani–Florina. The governors-general of Thessaloniki, Crete and Epirus were also given ministerial rank. To these was added the Governorate-General of Thrace in 1920–22, comprising Western Thrace and Eastern Thrace (returned to Turkey in the Armistice of Mudanya in 1922). The extensive but hitherto legally rather undefined powers of the governors-general created friction and confusion with other government branches, until their remit was exactly delineated in 1925. The governorates-general, except for that of Thessaloniki, were abolished in 1928, but re-established in December 1929—for Crete, Epirus, Thrace, and Macedonia—and delegated practically all ministerial authorities for their respective areas. Over the next decade, however, in a see-saw of legislative measures that in turns gave and took away authority, they gradually lost most of their powers in favour of the prefectures and the central government in Athens. Following liberation from the Axis occupation, in 1945 the Governorate-General of Northern Greece was established, initially with subordinate governorates for West Macedonia, Central Macedonia, East Macedonia, and Thrace, the first three of which were then grouped anew into a new Governorate-General of Macedonia, albeit still subject to the Governorate-General of Northern Greece. This awkward arrangement lasted until 1950, when the administration of Macedonia was streamlined, the junior governorates abolished and only the Governorate-General of Northern Greece retained. Finally, in 1955, the Governorate-General of Northern Greece was transformed into the Ministry of Northern Greece, and all other governorates-general elsewhere in Greece were abolished. From 1636 to 1815, Sweden typically appointed the Governors-General of Sweden for the Swedish Dominions on the eastern side of the Baltic and in northern Germany, but occasionally also for Scania. From 1809 to 1918 Russia designated Governors-General of Finland in the Grand Duchy of Finland; Governors-General of Poland in Vistula Land and other Governors-General in various other Governorates-General. From 1939 to 1944, during the German occupation of Poland, in that part of the country designated the General Government the Nazi official Hans Frank had the title Governor-General (German: Generalgouverneur für die besetzten polnischen Gebiete - Governor-General of the occupied Polish areas). From 1644 to 1911, in Qing Dynasty China, a Governor General or Viceroy (simplified Chinese: 总督; traditional Chinese: 總督; pinyin: Zǒngdū; Wade–Giles: Tsung3-tu1) was the highest official of joint military and civil affairs in one or several provinces. The hereditary shōgun of Japan (Japanese: 征夷大将軍, sei-i tai-shōgun) who ruled in the name of the Emperor from 1185 until 1868 were equivalent to governors-general, though they often had far greater power than a governor-general would ordinarily have. From 1895 to 1945, Taiwan was administered by the Japanese Governor-General of Taiwan (Japanese: 台湾総督, taiwan sōtoku). From 1910 to 1945, Korea was administered by the Japanese Governor-General of Korea (Japanese: 朝鮮総督, chōsen sōtoku). ^ See, e.g., Markwell, Donald (2016). Constitutional Conventions and the Headship of State: Australian Experience. Connor Court. ISBN 9781925501155. ^ a b IRNA, Online Edition. "Paris for further cultural cooperation with Iran". Archived from the original on 23 October 2007. Retrieved 21 October 2007. ^ Letter from the Queen's Private Secretary to the Speaker of the House of Representatives of Australia of 17 November 1975, at The Whitlam Dismissal, retrieved 15 February 2006. ^ "Papua New Guinea: Constitution of the Independent State of Papua New Guinea". ^ "The Government of Bahamas - Landing Page". Bahamas.gov.bs. Retrieved 2013-08-25. ^ "My Government(The Belize Government's Official Portal)". 2012-12-06. ^ "Office of the Governor General". GOV.gd. 2013-05-07. Retrieved 2013-08-25. ^ "Government". Tuvaluislands.com. 1999-04-26. Retrieved 2013-08-25. Wikimedia Commons has media related to Governors by territory.